Metropolitan Pilates teaches only authentic Pilates and delivers the very best in fitness instruction. Our instructors are certified by M.A.T. Pilates Teacher Certification Program and have each undergone 700 hours of rigorous training under internationally-renowned teacher trainer Dorothee VandeWalle. 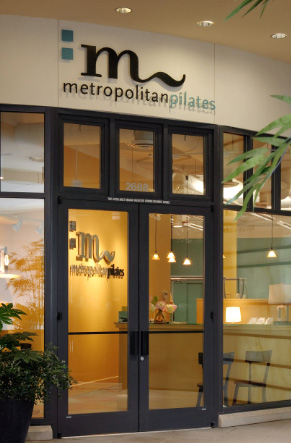 Metropolitan Pilates offers private, duet and semi-private sessions and group classes. Our state-of-the-art Pilates studio features 15 foot ceilings and spacious locker rooms complete with shower facilities. We are located in the University Village shopping center next to Crate & Barrel and above Jamba Juice. For easy access to the studio, park in the North garage. All parking in the U-Village is free. Sessions and classes (including MatPlus™) are by appointment only. Pre-registration and prepayment are required. We have a 24-hour cancellation policy. You will be charged for your session or class unless you call to cancel at least 24 hours in advance. You must wear socks to all sessions and group classes. Barefoot is not allowed. For your convenience, we carry non-slip ExerSocks and ToeSox for sale at the front desk. Do not wear jewelry, pants or shorts with zippers (the zippers damage the apparatus), or scented lotions and perfume.